Epidemiology ~ Just for Fun! is a problem-based adventure in which you are on a mission to discover the causes of diseases. As you follow clues to solve the mystery, you also are given the opportunity to explore ~ chemistry, pharmacology, neuroscience, medicine, public policy, history, and more. Developed by the Center for Technology in Teaching and Learning at Rice University for "students of all ages". 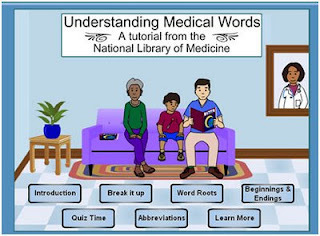 "This tutorial teaches you about medical words. You'll learn about how to put together parts of medical words. You'll also find quizzes to see what you've learned." You will need Flash Player to view the programs. But for those interested in a more serious online tutorial for learning medical terminology check out this excelence offering from Des Moines University. 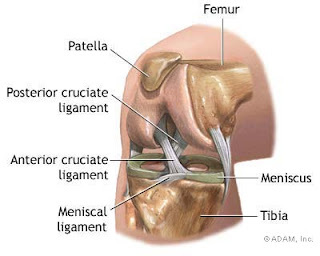 Broadcast entitled Knee Pain and the Weekend Warriors and will show a 'Small Incision Total Knee Replacement and Knee Arthroscopy'. Application Deadline Extended to March 16! "On February 17, President Obama signed into law the American Recovery and Reinvestment Act (“Recovery Act”) of 2009. The Recovery Act provides substantial additional funding for the Nursing Education Loan Repayment Program (NELRP)." Therefore the deadline for submission of this years applications has been extended to 5:00 pm ET March 16, 2009. Supplemental forms and documentation must be received or postmarked by March 16, 2009. Click on the title for more information and how to apply! Read the Applicant Information Bulletin.